Bartsch records an impression of Henri II entering the Temple of Immortality in Vienna. Zerner attributed it to Antonio Fantuzzi and identified the subject as Ignorance defeated. However, the present impression differs considerably from the recorded impression, in particular in the background, and it remains to be established if these are two states of the same plate or different versions of the same subject. 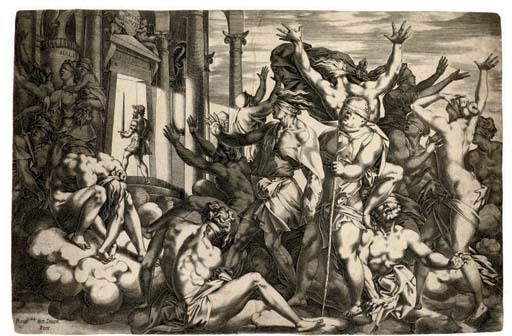 We are grateful to Catherine Jenkins, Metropolitan Museum of Art, for identifying the engraving Ignorance Defeated (Levron 7; Robert-Dumesnil VIII, 16) by René Boyvin (circa 1525-1625).